All transactions are safe and secure with a reliable history in online purchasing behind each of our associates. Buy the Mr. Bump t-shirt to own Mr. Men clothing and merchandise. If you are accident prone like I am then you can relate to Mr. Bump. He hurts himself day in and day out whether he is at work, at home or on vacation. Eventually he realizes that you can make anything a positive and gets a job that suits his "abilities" well. Remind people that you can turn any situation around with this Mr. Bump t-shirt. Also grab a Mr. Bump plush to squeeze the next time you get hurt. 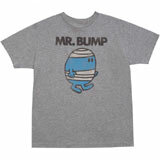 In addition to the Mr. Bump tee above, browse the Mr. Men Clothing Gallery for more apparel like men's and women's clothes, kids shirts or hoodies.